It seems to me that the Trestle Bases would get in the way when working at the table. A simple bottom stretcher rail connecting the legs and that supports the lowest shelf and is kept off the floor could eliminate the Trestle Bases. The lower shelves, if made from solid wood could expand against the legs and stress the joinery. Either installing lower shelves a little narrower than the inside space between the legs or notching the legs would allow for expansion. The bread board ends are fine, but can be a lot of work and a little tricky to get tight joints that allow the top to expand and contract across the top’s width. Since you are building this craft table, the height can be whatever you like. Therefore the table surface would ideally be a height that is most comfortable for the person using the table. This height may be 36” or maybe some other height. 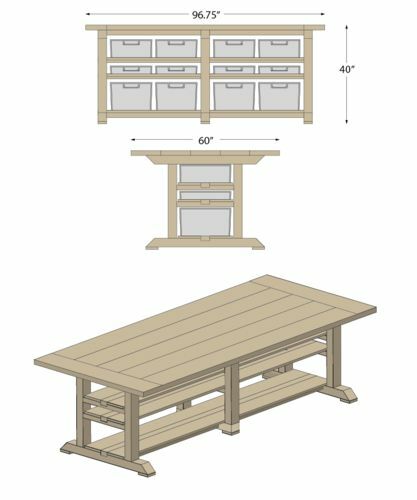 On the other hand, if the craft table will be used while seated, a height of 36” would make it fairly easy and inexpensive to buy stools. It looks really pretty and as someone who has done crafts (wire jewelry, watercolor and oil painting, even some quilting years ago with hand dyed fabrics) the “pretty” aspect worries me. I suggest that you consider making some accessories for it that are giant placemats made of Formica laminate that will protect the wood top from damage during crafts that involve adhesives, dyes, knives, and the occasional hammer. That is HUGE. In my house, a 60 wide table that tall would leave about 20 inches in the middle unused. I think your aprons are way over built. The trestles you have should provide more than adequate support for the top. Speaking of the top, getting a smooth work surface for crafting using planks and at your sizes is going to be tough. I’d consider a couple of layers of MDF and wood filler for any joints on the top surface. Or skin the top with laminate as suggested earlier. If you go the MDF route, adding some edge banding can dress it up and protect the edges at the same time. Just my opinions, your results may vary. Thanks, Dan. Yes it’s ginormous. In reality, the table is being made for my autistic son to build his train sets on. He LOVES trains and would likely use up every square inch, including the center of the table (even though he wouldn’t be handling much in that hard-to-reach center)...the trains would roll over all of it. Our thinking is that once he’s grown out of the trains, my wife would then claim the table for quilting, one of the only other rare circumstances in which such a large surface would actually be able to be fully utilized. Regarding the aprons, I was concerned about left-right stability, since the only thing other than the aprons preventing left-right movement would be the shelves. Unlike most trestle tables that have a “tall” stretcher to keep it left-right stable. Am I overthinking? That is HUGE. In my house, a 60 wide table that tall would leave about 20 inches in the middle unused. I can’t help but wonder, what kind of crafts? 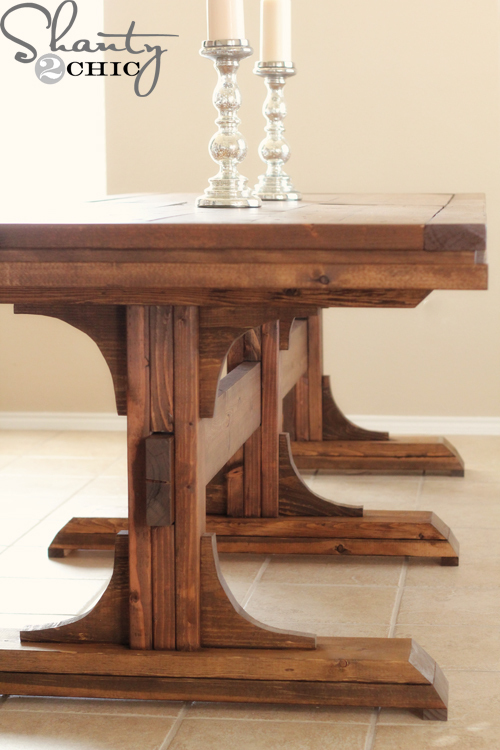 Overall, the table seems “over-engineered” for simple handcrafts. Do you need a lot of strength? Will you be pounding on it? If not, you can probably save yourself a lot of construction difficulty. If you use 8/4 (or even 5/4) stock for the top and shelves, I think you can skip the torsion-box aprons and the “key” in the shelves (which would also leave expansion/contraction space for the shelf boards). Just fasten the top and shelf boards with screws through the trestle arms and horizontal braces. Unless you need all that strength . . . Thanks VERY much, JBrow… I’m not sure how I missed that! Those shelves would absolutely buckle (they would be either .75” or 1”on either side of the stretcher in the middle). I can easily make them a bit narrower and still have enough depth for the wire baskets. Regarding the breadboard ends, would you suggest skipping that and just going with planks showing the end grain? Thanks, Jim. Technically it’s a craft table, but specifically it would be used for staging train sets. One question regarding your comment on fastening (if I’m understanding you correctly), wouldn’t attaching the top and shelves with screws prevent seasonal wood movement? if I’m understanding you correctly), wouldn’t attaching the top and shelves with screws prevent seasonal wood movement? Yes it would, use slots or over sized holes in the trestles to allow for movement. Note that wood movement in conditioned spaces is often less than we worry about. Still, better safe than sorry. Me, I’d put two screws into each shelf board at each horizontal brace. The one on the outside would be just a straight screw hole. The one on the inside would go through an elongated hole. With a space between the boards (where the “key” used to be), any seasonal movement would be toward the middle of the shelf. Functionally, the shelves would appear to be “fixed”. The same concept would apply to the top, but if the top boards are glued together (which seems a good idea), you would use straight holes on the middle board (not enough width to worry about) and elongated holes on all the outside boards. Why not build a simpler table like this one? Kidding but not kidding. Had to put it out there since its a woodworking themed page. This one seems simpler yet pretty nice looking on Ana White’s page. I think over time a lot of her project might have some woodworking blunders but they do look nice in the pictures. For simplicity, a lot of the things that are wrong might not show their face in the time you are planning to own the table. If you screw it together and it last a few years. Win!!! I’m sure my wife would like thoughs designs and I can build a project that simple fairly quickly. If you want them to last for centuries, your grand kids might find issues but is that really your concern right now. I’m with you there, Rick. Admittedly it was Anna White’s easy plans that got me interested in woodworking a couple of years ago, but it didn’t take long to discover that there were some serious flaws in the craftsmanship she was employing in her projects. That’s not to dismiss what she brings to the world of DIY woodworking… many people wouldn’t be doing anything with wood at all if it wasn’t for her and others like her. But my interest is definitely in creating much more lasting and sound pieces. Not to mention that I’d love nothing more than to make carpentry (specifically furniture-making) my full-time gig. Someday. Hopefully. So in the meantime, I intend to follow best practices and teach myself to do things the right way, even if it means it takes longer. And make more mistakes. And waste more wood. Many years ago, I built a train table for my son. The framing and supports for the top were all 1×4 and the top itself was Homosote. Not sure if they make it any more, but it was a low density fiberboard about 3/4 thick. I seem to recall that the under frame was on 16” centers and the whole thing was screwed together. I used plain 2×4s for the legs. The table was in a loft so the legs were maybe 24” long. The table itself was a dogbone overall about 18’ long, 4’ squares at the ends and a 3’ wide connecter section with angled section to the squares. It survived quite well between both my son and I climbing all over it to lay track, build mountains, landscape, etc. We eventually moved and ended up giving the layout to a neighbor. Simple matter to unscrew the section, lift and disconnect the tracks, then carry it out. Trains and quilts weigh next to nothing. Some type of sheet goods for the top will make working with both easier. Save your barn wood for a show piece, or rim the top with it. BTW, my wife sews and occasionally needs a large layout table. Our solution was to buy a ping pong table. Huge flat and smooth surface when she needs it and when she doesn’t, it’s still fun to have around. This table will be visible from the kitchen and dining room (in a sunroom that’s adjacent to both), so my wife was adamant that it be crafted like a showpiece. But I hear you, Dan… if that wasn’t the case, I’d be designing and building something much more basic and utilitarian. The boss has spoken. I assumed this would be in a shop or basement. Now I have clarity and understand completely. Your smaller design looks like it will fit the bill. The breadboard ends on those planks are still going to be a bit of a challenge, but are doable with patience. If you want a show piece, consider pegs in the breadboards. Tight fit in the center and progressively larger slots towards the ends to allow for wood movement. 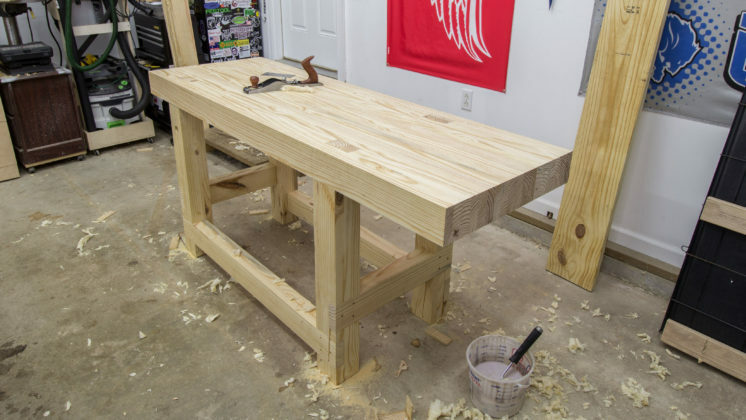 Please post pictures of your finished table.